I'm considering replacing the Lightning Bolts with either Pinbits or Hooked..... Not sure which brand or which lighting effect to go with... Any help would be Greatly Appreciated. Which Hooked did you go with? Gen4 with white lights? Red or Stainless frame? Gen 4 white lights. Red frame to match my Premium Vault. I Appreciate all the input..... It sounds like you can’t go wrong with either brand. They leave the factory in 2 hrs. Thanks as always for your support. Curious to hear your opinions and review. I’ve been going back and forth on what to do with my acdc; hooked bolts, pinbits bolts, or pinstadium and/or Orion’s Belt. Overwhelmed with the possibilities lol. Have the Hooked gen 2 I believe. 1. If using pinstadium use gen 4. 2. If playing in a normal lit room get gen 4. 3. If playing in a pitch black room I like gen 2 not as bright. That being said we have very few gen 2 boards left. We do however have a few aprons and ramp decals left. Decals shown on above picture. I have a set of your ramp decals. How easy/hard are they to install? i.e. Are the ramps fairly easy to remove/replace? Any tips/tricks to installing? Tips take your time it will take you 30 to 45 min to install. Ramps should be removed which isn't hard everything has quick connects. Another tip install using an old credit card or small tinting squeegee. If using wet method of applying it will take 24hrs to dry clear. My decals are made in colored layers just like the B/W decals so they are strong and thick easy to install. I will definitely post as soon as I get the lightning bolts on..... We already have the Pin Stadium lights and are very pleased with them.... It’s Amazing how they light up the playfield and blend with the game. I have a set of the Luci Red Gen 4 with yellow lights brand new from Cointaker. Our Hooked stainless steel with blue Lightning Bolts have arrived and are installed..... I Really like them! The blue Lighting goes Great and the brightness is absolutely perfect. I was playing in a room with nothing on but the machine and they weren’t overpowering at all. But, I also have Pin Stadium Lights that add a lot of flash and could be taking away from the flash of the lightning bolts..... but not in a bad way... the two lighting mods go great together. In my opinion, both mods are a must. 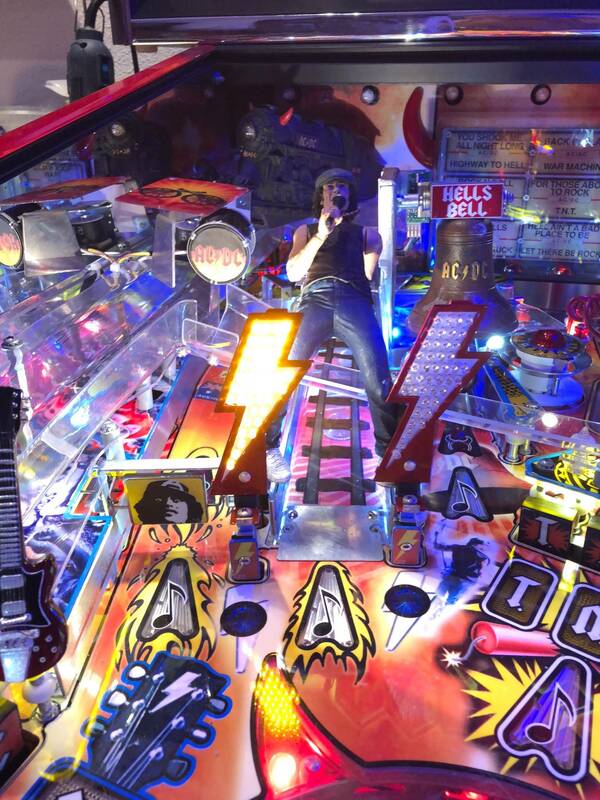 The Pin Stadiums light the whole playfield up and enhances your game play and the interactiveness of the Lightning Bolts is Absolutely Cool. Sweet. Thanks for the follow up. I’ll probably get the hooked ones soon enough; just gotta decide on blue or white. Then will decide if I should add the pinstadium with it or not. I still haven’t got the color dmd for mine though either. Trying to save up for another pin so mod funds are scarce haha. Mine are yellow as can be seen in above picture. The blend in quite well and are not to bright. Also I have yellow convolux which makes a nice package in total. If you wanna save some money against a colordmd you could also Make yourself a smartdmd diy or less diy with a pin2dmd which is smartdmd compatible. For AC/DC there is a colorfile available. Guys, Sold my lightning bolts last night and just shipped today.